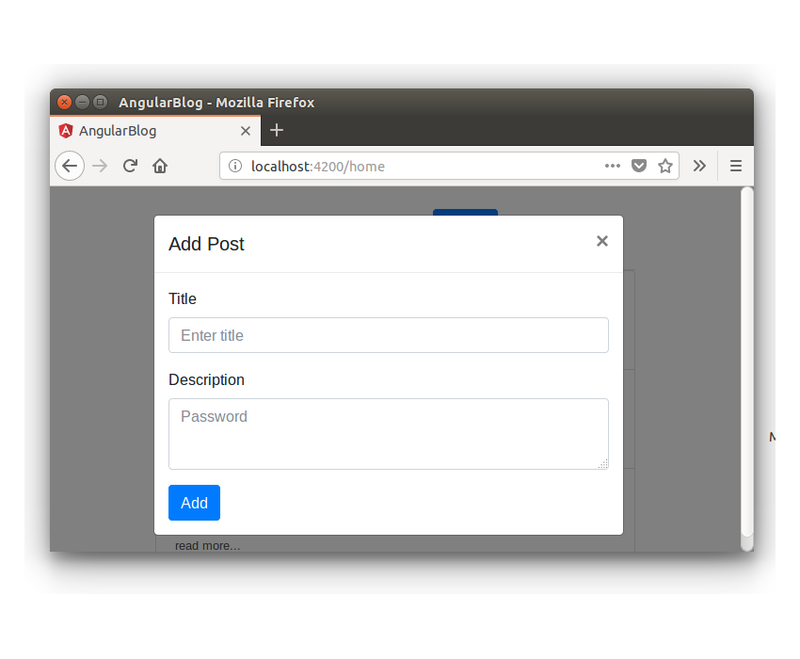 In the previous part of the Angular blog tutorial series, you learnt how to create the ShowPostComponent to display the list of blog posts on the home page. You fetched the records that were inserted from the MongoDB shell using the created REST API endpoint. In this tutorial, you'll be creating a new component called AddPostComponent to provide the user interface to add a new blog post to the MongoDB database. Let's get started by cloning the source code from the previous part of the tutorial series. Once you have the dependencies installed, restart the client and server application. You'll be showing the add post component as a popup. Now you need to add the AddPostComponent to the NgModule. Import the AddPostComponent in the app.module.ts file. To trigger the add post popup, you have already added the data-target attribute to the button in home.component.html. Save the above changes and restart the application. Log into the application and click on the Add link in the home page. You will have the AddPostComponent displayed as a popup. Add the ngModel directive to the input elements for title and description. Add a click directive to the button for calling the method to save the blog post. Import the Post model from src/app/models/post.model.ts in the add-post.component.ts file. Define the post variable in the add-post.component.ts file. Inside the AddPostService, create a method called addPost to make the REST API call. As seen in the above code, you have made use of the HttpClient to make the API call and return the Observable. In the add-post.component.ts file inside the addPost method, you'll subscribe to the addPost method from the add-post.service.ts file. First, you need to connect to the MongoDB database using the Mongoose client. Once the connection has been established, you need to create a model object using the Post schema defined in the server/model/post.js file. As seen in the above code, you created the Post object using the title and description passed in from the request req object. Call the save method on the Post object to save the entry to MongoDB. As seen in the above code, once the save method callback is called with no error, it will return the success message along with the returned object doc. Save the above changes and restart both Angular and Node servers. Sign in to the application and try to add a new blog post. Once you click on the Add button, check the browser console and you will have the success response logged. When the blog post details are added to the database successfully, you need to close the popup. In order to close the popup, there is a close button which you need to click programmatically. You'll be using the @ViewChild decorator to access the close button. Import ViewChild and ElementRef in AddPostComponent. Add the above code to the success callback of the addPost method. Here is the addPost method from add-post.component.ts. Save the changes and restart the client server. Log into the application and try adding a new blog post. Once the blog post details have been saved successfully, the popup will close. One thing to note is that the newly added blog post doesn't show up in the blog post list. So you need to add a trigger to notify when to update the ShowPostComponent. You'll be making use of a common service to communicate between the two components. As seen in the above code, you have declared a Subject called postAdded_Observable to keep track of the new blog post addition to the database. Whenever a new blog post is added to the database, you'll call the notifyPostAddition method, which will notify the subscribers about the update. Import CommonService in the show-post.component.ts file and initialize it in the constructor method. Save the above changes and restart the client server. Log in to the application and add a new blog post. Once added, the blog post list gets updated with the new blog post. In this tutorial, you created the AddPostComponent to add the blog post details to the MongoDB database. You created the REST API for saving a blog post to the MongoDB database using the Mongoose client. In the next part of the series, you'll implement the functionality to edit and update the blog post details. Source code for this tutorial is available on GitHub. How was your experience so far? Do let me know your valuable suggestions in the comments below.